The Illinois Bicycle Lawyers at Keating Law Office won a strongly contested lawsuit for an injured Chicago bicycle commuter who was struck by a motorist on northbound Central Street near its intersection with Elston. The bike crash occurred when the bicyclist was traveling along with traffic on northbound Central Avenue near its intersection with Elston on the Northwest Side of Chicago. As the bicyclist approached the intersection of Central and Elston he passed the defendant’s Mercedes on the car's passenger side. This position put the bicyclist appropriately between the parked cars along the curb and the northbound lane of traffic. Illinois law requires bicyclists to ride "as near as is practicable" to the curb. However, as traffic moved forward along Central and the Mercedes approached the intersection with Elston, the defendant driver pulled to his right and hit the cyclist. This is known as a "right cross" collision. As a result of the crash the bicyclist suffered a head injury and back injury. Upon obtaining the case, the Illinois Bicycle Lawyers at Keating Law Offices attempted to negotiate a settlement with the insurance company for the driver of the Mercedes. Our position was simple: this was a "right cross" collision that was 100% the fault of the motorist. But the insurance company did what insurance companies often do: they blamed the bicyclist and refused to compensate the bicyclist with a single penny. Our response was strong and immediate. We filed a lawsuit on behalf of the bicyclist in the Circuit Court of Cook County. The bicyclist luckily escaped this collision with "relatively minor" injuries to his head and back. But these injuries required a period of recuperation, lost time from work, extensive medical treatment including physical therapy, and lost time from work. To the bicyclist the phrase "relatively minor" was mere semantics. He deserved justice. Even after filing the lawsuit and taking the depositions (sworn statements under oath) of the Mercedes driver and his passenger, they stuck to their story that the car was traveling straight and the bicyclist caused the bicycle accident. The judge handling the case ordered the parties to participate in a Mandatory Arbitration. An arbitration is a form of "alternative dispute resolution," meaning that the parties present their cases to three arbitrators and those arbitrators issue a ruling. The ruling is non-binding, either party can continue to trial if they wish. But the goal is that by participating in a non-biased arbitration that the parties will be able to sort out the case prior to the trial. Agreed that immediately before the crash his lane became wider due to the end of the parking zone. Agreed that it was always safest to travel in the center of his lane. Agreed that he always steers to the center of his lane as soon as the lane gets wider. Agreed he had a clear and unobstructed view of the right side of his vehicle immediately prior to the impact. Section 11-1003.1 of the Illinois Rules of the Road requires that drivers of vehicles exercise due care to avoid colliding with any person operating a bicycle. 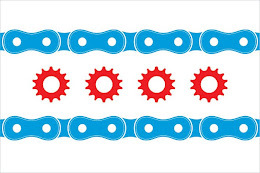 Section 11-703 of the Illinois Rules of the Road which prohibit motorists from "buzzing" bicyclists as the motorists pass a bicycle and requires "3-Feet" between the motor vehicle and bicycle. Chicago Municipal Code 9-16-020 also prohibits motorists from turning right in front of a bicyclist. "I like to think that this case is a great example of our commitment to doing what we can for any bicyclist injured anywhere in Illinois at any time. Many firms, including others claiming to be "bike lawyers," probably would have not taken on this case because of the hard line set by the insurance company. But that isn't what we do at Keating Law Offices. What we do is put forth every effort we can to get results for our clients. At the end of the day it's all about the results you get for victims of bicycle crashes. Actions always speak louder than words." Keating Law Offices is the premiere law firm handling bicycle accident cases in Illinois. The firm has emerged as a national leader in the growing field of bicycle litigation. Attorney Michael S. Keating currently serves as the Chair of the Bicycle Litigation Committee for the national trial lawyer's organization. The firm has a strong history of delivering results for victims of bicycle accidents throughout Illinois. Click here for a list of results by the firm. If you have any questions regarding this post or an issue involving Illinois personal injury law, contact Illinois Bicycle Attorney Mike Keating at 312-208-7702 or MKeating@KeatingLegal.com 24 hours a day, 7 days a week. All e-mails and phone calls are returned promptly. All initial consultations are confidential and free.